Kathy Page and Carina Vaughn of DMRE work in the cold to plant trees. Pouring rain and cold temperatures on March 28, 2018 couldn’t stop a group of volunteers, state government employees and students from planting trees in an effort to reforest a piece of the Commonwealth. Green Forests Work (GFW), a nonprofit out of Lexington, along with 54 Department for Natural Resources (DNR) employees, 21 University of Delaware students, the Kentucky Department of Fish and Wildlife Resources (KDFWR) and the Appalachian Regional Reforestation Initiative, braved the weather to plant over 3,000 tree seedlings at the Rockcastle River Wildlife Management Area. Volunteers plant seedlings in loosened soil. The mission for the day was to improve disturbed landscapes that were once mined to native habitat restoration. These forests, once established, provide essential ecosystem services, downstream water quality improvements and benefits to local communities and economic development. The Rockcastle River Wildlife Management Area is public land managed by the KDFWR near Ano, Kentucky. The majority of the 2,924 acres has been surface mined prior to the KDFWR’s acquisition of the land in 2016. The land was left as unmanaged pasture, which is unsuitable for other uses without intervention due to the prior use of traditional post-Surface Mining Control and Reclamation Act techniques. These techniques often result in heavily compacted soils, which when seeded with aggressive, non-native grasses and legumes, hinder the development of native forests. The selected 25-acres for tree planting had been prepared in advance by removing exotic vegetation and plowing the site to loosen the soil. This technique promotes an ideal rooting environment for plants, and allows rainfall to infiltrate the ground instead of running off, which reduces erosion and also improves the water quality in local streams. The trees planted will improve wildlife habitat and reestablish the oak-pine forest type that once grew on the site before mining. Using native trees purchased from the Kentucky Division of Forestry, volunteers planted 11.5 of the 25 acres on this site. A mix of white oak, northern red oak, black oak, chestnut oak, silky and roughleaf dogwoods, shortleaf pine, persimmon, black cherry, yellow-poplar, American chestnut, wild plum and blackgum were planted. The Division of Mine Reclamation and Enforcement employees were out in full force to plant seedlings. 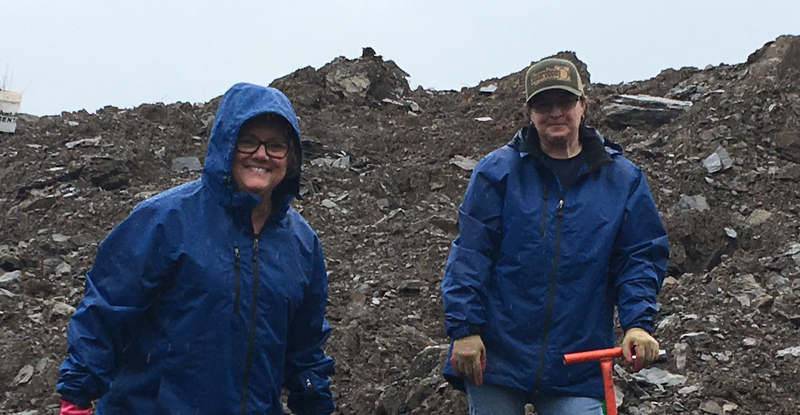 Some of the Division of Abandoned Mine Lands employees also braved the weather to help plant trees. Cold temperatures didn’t deter employees from the Division of Mine Permits from lending a helping hand. To date, Green Forests Work has planted nearly 8,000 trees on other reclaimed strip mines in eastern Kentucky. Two additional volunteer events in April will complete the planting on the remaining 13.5 acres at the Rockcastle River Wildlife Management Area. For more information about planting trees with Green Forests Work, contact Dr. Chris Barton by e-mail at barton@uky.edu, or visit https://www.facebook.com/Greenforestswork/.